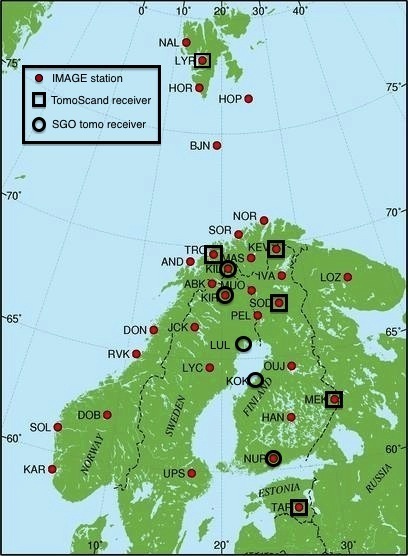 The sixth receiver of the TomoScand network of the Finnish Meteorological Institute will be installed in Longyearbyen, Svalbard, Norway, in September. Expedition preparation commenced early August by testing the receiver at SGO. Today we will send the instrument to Helsinki for further testing. Expedition to Svalbard will commence September 12 with a return flight five days later. Instrument will be installed in the Kjell Henriksen Observatory. The total number of FMI & SGO ionospheric tomography receivers will be 11 after the (hopefully) successful expedition to Svalbard! Detailed info on the technology of the tomography receiver at Jitter website http://www.sgo.fi/~j/jitter/web/! TomoScand and SGO tomography receivers with the new Longyearbyen station (LYR). Map also shows the IMAGE magnetometer network station locations.